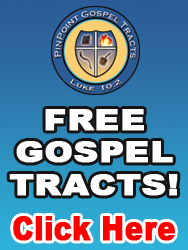 This tract is great and well received by most. I love to share with he's, Mormons, and people who like rap music. Great tract for reaching the youth. The front gets their attention to where they want to read the entire back of the tract. Once they do read it in its entirety, then I'm able to share the Gospel Message of Jesus Christ and what He has done for me (delivering me from a similar lifestyle that 2Pac and Biggie lived). I find it to be a great witness tool to help reach the younger generation. Thank you. We purchased these especially for our youth/teens. The teens can relate and know who Biggie and Tupac are. 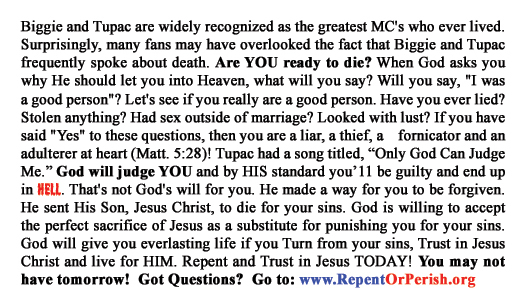 Again, a great conversational tract for teens. Outstanding Gospel Tract! It really catches the attention of those who see it and raises their curiousity to read it! 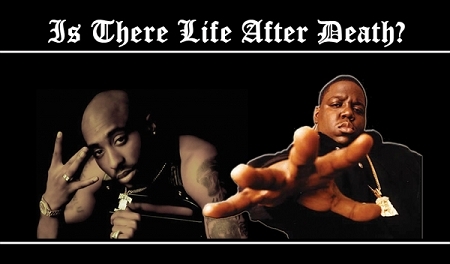 Young men gladly accept this track and most identify with Tupac and Biggie. My focus is in the inner city of Los Angeles with an emphasis around the local high schools. This track is a winner.